NEW YORK (CNNfn) - Airline stocks fell sharply Monday, as another major carrier announced layoffs and industry officials warned they are experiencing a cash crunch due to the public's reluctance to return to the air. The financial crisis in the industry was best illustrated by a warning from Continental Airlines, one of the industry's two profitable carriers before Tuesday's terrorist attack, that it would miss $70 million in loan payments due today due to the current circumstances. Shares of Continental (CAL: down $19.59 to $20.05, Research, Estimates) lost nearly half their value Monday as trading resumed for the first time since hijacked commercial jets were used in the nation's worst terrorist attack. All other major passenger carriers also posted deep declines in stock value, although several, including Continental, showed a slight rebound from the lows of the day. The airlines have been hit by an almost total halt in buying of new tickets by both business and leisure travelers, causing a severe cash crunch for the capital-intensive industry. Continental's filing said that it would miss making $70 million in payments due Monday on Enhanced Equipment Trust Certificates, which are loans backed by aircraft. It said that all those missed payments have a five-to-10 day grace period, but that is being hit with a severe liquidity problem due to the last week's events, including the grounding of all aircraft for more than two days, the increased security measures and the severe drop in demand for tickets. The Houston-based carrier had already announced Saturday it will cut its staff and schedule by about 20 percent. It said Monday the reduced schedule would mean the end of service to 10 cities. While Continental was the first to announce layoffs, it won't be the last. Executives with American told CNN Monday that it expects to announce job cuts as early as midweek, while Northwest Airlines is also expecting staff cut announcements.� US Airways said Monday it will cut as many as 11,000 jobs, or nearly a quarter of its work force. America West Airlines and American Trans Air are also planning staff cuts. Among major carriers, US Airways (U: down $6.05 to $5.57, Research, Estimates) could be one most affected by security concerns. It saw its stock lose more than half its value Monday. US Airways' most valuable franchise, the New York-Washington shuttle, still is grounded due to the at least temporary closing of Reagan National Airport in Washington. Some are recommending that the airport remain closed. And the shuttle has the greatest ground competition of any profitable airline route in the form of Amtrak's high-speed Metroliner and Acela service. US Airways was already one of four airlines with junk bond status for its debt, and was struggling to implement a turnaround plan even before the blast. While it was seeking approval for a then-proposed, since-blocked purchase by UAL Corp., its own executives argued it was having difficulty finding a niche in which to survive without a merger. Continental CEO Gordon Bethune called for a federal bailout of the industry Monday, repeating his plea of Saturday when announcing the layoffs. "Our industry needs immediate Congressional action if the nation's air transportation system is to survive," he said in his Saturday statement. Continental Airlines missed $70 million in payments Monday on certificates backed by its jets, as the company sought a federal bailout to help the airline industry weather its current cash crunch. The industry got some shows of support in that matter Sunday and Monday. White House spokesman Ari Fleisher said Monday that President Bush would participate in meetings Monday about the state of the industry. "He's very concerned about the health of the airline industry," Fleischer said. Democratic and Republican leaders reached agreement Friday on a $2.5 billion assistance package, only to see that emergency relief blocked by a parliamentary maneuver by U.S. Rep. Lloyd Doggett, D-Texas, who objected to the hasty move to provide assistance. "Perhaps that subsidy is well justified. I may vote for it myself because it is so compelling," he said in floor remarks Friday. "But if it is so compelling, it will be as compelling in the bright light of day as it is with insults and threats at midnight." House Majority Whip Tom DeLay, R-Texas, issued a statement Sunday saying he was confident that the measure would win necessary support soon. "We've got to stabilize the major airlines with federal assistance," said DeLay's statement. "The airlines are a national economic asset and if they spiral into bankruptcy, our broader economy will suffer unacceptable damage. But despite those signs of support in Congress and from the administration, the nation's three largest airline companies, AMR Corp. (AMR: down $11.70 to $18.00, Research, Estimates), owner of American Airlines and Trans World Airlines, United Airlines owner UAL Corp. (UAL: down $13.32 to $17.50, Research, Estimates), and Delta Air Lines (DAL: down $16.61 to $20.64, Research, Estimates), all closed off at least 39 percent Monday. Also in trouble is American West Airlines Holdings (AWA: down $5.60 to $3.00, Research, Estimates), the Phoenix-based carrier that had been one of the few to cut staff in a cost-cutting effort even before the terrorist attack. Its stock closed down by nearly two-thirds. Northwest Airlines (NWAC: down $7.20 to $12.42, Research, Estimates), the nation's fourth-largest air carrier, and discount carrier Southwest Airlines (LUV: down $4.12 to $13.00, Research, Estimates) both fared better than other major carriers, but Northwest lost more than a third of its value and Southwest was down by nearly a quarter of its previous value at the close. The airline industry had already projected losses of more than $3 billion this year due to a sharp drop in business travel caused by the slowing of the U.S. economy before the hijackings. "We've known for some time that the airline industry has been operating close to the limit of solvency," said DeLay's statement Sunday supporting a federal bailout. "Unfortunately, there's no way in the world that the major airlines could have prepared themselves to weather the financial setback they took following the terrorist attacks last Tuesday." Michael Boyd, president of Boyd Group Aviation, an Evergreen, Colo., aviation consulting group, blamed the ineffective response of the Federal Aviation Administration for the financial crisis hitting the airline industry. He said the FAA has taken mostly ineffective steps to assure customers that further hijackings could not take place, and recommended steps including immediate arming of pilots and deployment of police and national guard to provide airport security. "It's going to take turning our airports into some place people feel safe to save the industry," he said. "The terrorists have our airline system ready to collapse just like the World Trade Center and it's due to the ineptitude of the FAA. I think several airlines are days away from filing for bankruptcy protection." 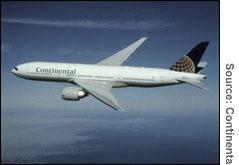 He cited Continental, America West and US Airways as those most at risk in the current environment. The Air Transport Association estimated Friday that the industry as a whole has only 30 days of cash available due to the reluctance of both business and leisure travelers to resume flying. The industry is lobbying Congress to be included in any disaster relief package. The air cargo sector was in far better shape than the passenger carriers, with United Parcel Service (UPS: down $2.73 to $50.37, Research, Estimates), FedEx Corp. (FDX: down $1.68 to $38.30, Research, Estimates), and Atlas Air (CGO: down $1.05 to $11.08, Research, Estimates) all losing less than 10 percent in Monday trading. The biggest decline in the sector was Airborne Inc. (ABF: down $2.06 to $10.10, Research, Estimates), operator of Airborne Express, which saw shares fall 17 percent to close at its daily low, but still better than any passenger carrier. UPS, the world's largest transportation company and one of the most cash-rich companies in any sector, announced it would resume a share buyback program, spending up to $1.3 billion to repurchase it shares. UPS CEO Jim Kelly told CNNfn Tuesday that things had pretty much returned to normal at the package carrier, that the use of trucks and the time of the weekend had taken care of backlog of packages that built up last week. He said that the company should be able to deal with the costs and delays cause by any additional security measures. "It'll have an impact doing additional things, taking additional time and costing some additional money," he said. "But there are only a few places in the world where there will be a slight delay from the normal routine fashion."